Convenient 1st Floor Unit Offers Easy Access To the Pool and Beach. This 1st class get-away is located in the heart of Ft Lauderdale's beach resort area. Positioned directly on the Intracoastal Waterway and only 1 block from the beach, comfort luxury and relaxation are all close at hand. This is a true 1 bedroom/1 bath condo (not a studio) and comfortably accommodates 2 guests. Laundry located within the unit. High speed internet, cable and all utilities included, 65' 3D television in the living room and bedroom. Fully functional kitchen with complete cutlery suitable for a gourmet chef. There is also a Baby Grand Piano in the living room. 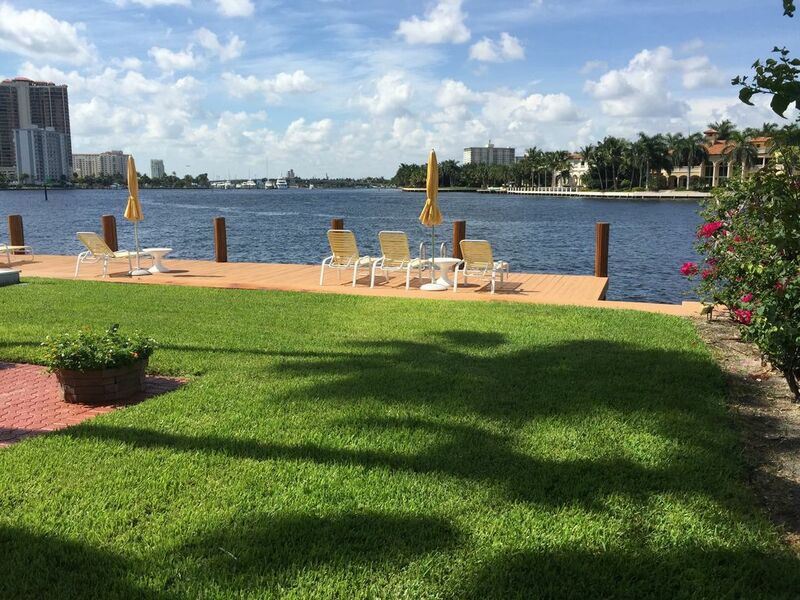 A private patio opens up to the community's common Intracoastal dock. If your goal is to relax in luxury, you found the right place. The rental comes with garage parking, but there is really no need for a car. You can walk to the many restaurants and shops located in the immediate area, and you are just steps to the beach. Public transportation options include Broward County's extensive network of buses and trolleys, and more uniquely, the shared bike system and water taxis. A perfect 1st class get-away! This unit is truly turnkey. You only need to bring your luggage. I'm a retired Army officer, and have been a Broker-Associate with Coldwell Banker in Florida for the past 17 years. If I can assist you with any of your real estate needs, please ask. Se habla Español. This is one of the best locations to be on Ft Lauderdale Beach. If your intent is to relax, there is no need for a car. You can walk to the many restaurants and shops located in the immediate area, and you are just steps to the beach. Public transportation options include Broward County's extensive network of buses and trolleys, and more uniquely, the shared bike system and water taxis. A perfect 1st class get-away! The unit is turnkey. You only need to bring your luggage. Just one block from the ocean. Water views from the private patio, and community dock and pool deck areas. Laundry room in the unit. High speed internet and extended basic cable. Bathroom and beach towels available along with 2 beach chairs. Contemporary design, baby grand piano in the living room. (Contemporary white leather sofa is not suitable for sleeping). Automatic Espresso machine, Keurig, and traditional drip coffee maker available. Full set of cutleries and cookware, even for a gourmet chef. Breakfast bar counter in the kitchen seats 2, and outside dining space seats 4. Comcast extended basic cable in living room and bedroom. Private patio has 2 lounge chairs and a table for 4 people. Community dock has multiple lounges, tables and chairs. Private patio just off the Living Room with access to the community dock on the Intracoastal Waterway. Heated pool just steps from the front door. Loved sitting on the dock watching the boats go by. Pool was great and condo perfect. We enjoyed our stay very much at Michael's condo. It was lovingly appointed and outfitted with whatever we needed. The unit itself was private with its own patio garden area. We could walk to the boardwalk and beach a block away. Husband could watch the boating activity on the intracoastal in the "front yard". Parking was covered and convenient. Michael was very attentive and easily reachable during the whole process of using VRBO. We had to change our original plans and he was most accommodating. If you are looking for a place to stay in Ft. Lauderdale, look no further. The location of this condo is perfect! We loved that we could wake up in the morning and head out to the dock to enjoy views of the Intercoastal. We also loved that we were just blocks from the beach (5 min. walk!). The pool was also lovely, and we enjoyed many of our afternoons lounging by it. This first-floor condo was super convenient, and is, indeed, turnkey. Mike had everything that we needed for our stay -- including beach towels, cooler, and beach chairs! The condo was very clean, and we were very comfortable. We appreciated Mike's quick responses during the booking process. Everything was a breeze! We would stay again in a heartbeat. Don't miss your chance to enjoy this perfect location, too! This one-bedroom hideaway was perfect for my April vacation in Ft. Lauderdale. It is beautifully furnished and immaculately maintained. It doesn't hurt that the beach is only five minutes by foot, and that the community swimming pool and sunning dock sit right on the intracoastal -- beautiful sunsets from the dock. Gorgeous...exactly what it looks like..yet larger! Place is beautiful. Great location. Private. Travel using vrbo frequently..and would highly suggest this residence. Walkable to the best beaches Ft lauderdale has to offer, along with fine dining and beachfront shopping. Also accessible to the Broward public bike system with a station less than a block away. The closest water taxi stop is 4 blocks away.